Pope Francis has asked us to “welcome, promote, protect and integrate refugees and migrants.” Since 2015, the Sydney Alliance has been running a campaign to change the conversation about people seeking asylum and working with parishes to open a conversation about those who come to Australia fleeing persecution and in search of safety. 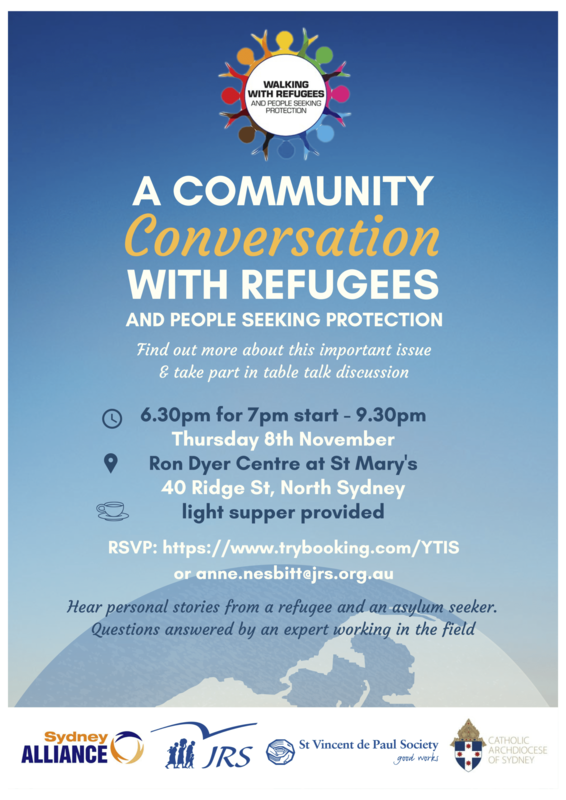 To start this conversation our North Sydney parish is running a Table Talk with guest speakers including a person seeking protection, as well as a professional who works with people seeking asylum and refugees. Listen to a real life experience of seeking safety, share your own story, ask your questions in a safe, respectful space and consider how we can act. (behind St. Mary’s church), North Sydney. Everyone from ST CANICE’S is most welcome! Table Talk explanation Opening a dialogue with people seeking asylum . .